Sweat poured off of me and parts of my body hurt that I didn't even know I had. I was ready to quit, I just knew I couldn't complete the last 10 minutes of the workout I had begun. I was upset that I had let myself get to the point that what had once been a routine task now felt like I was dying and I'll be honest, I had tears rolling down my face. Yet I pushed through-and I did finish. Not only that first day, but many days past it. Before you click the X at the top right of your screen, stick with me for a minute. I promise that this is not an exercise post about how I lost X number of pounds etc. Anyone who looks at my picture can tell that I am not at that "ideal" weight or BMI. I am not a dietitian or physical fitness expert and I won't pretend to be. That is why this post is not about that. What this post IS about is perseverance-not giving up. I am not blessed to be one of those people who just LOVES exercise. I don't dream of entering and winning a 5k. But I am someone who wants to be healthy and for me that means increasing my exercise. It means doing something that isn't especially fun in order to receive a benefit that exceeds the work I put into it. And it occurred to me that this is a principle that applies to all areas of life, and it is one that God encourages us to apply. James 1:12 reminds us that the person who perseveres, who withstands the trials of this life, will receive a crown of life. Our walk as a follower of Jesus isn't always an easy one. Just ask the teenager whose parents disown them for doing so (and yes, I personally know people that this has happened to here in the United States!). Ask the families of the Libyan migrants who were thrown overboard and left to drown last week if following Jesus is easy. Talk to the child in public school who is made fun of for carrying his or her Bible to class with them to see if they think following Jesus is easy. Or ask the man who has to decide whether to do what is right and possibly lose his job, or do what Jesus teaches is wrong. You don't have to live in another country to experience trials as a part of following Jesus example. I don't know what you are going through right now. You may be struggling to maintain a healthy lifestyle, or you may be in a situation like one of those above. Whatever you are going through, let me remind you that you CAN get through this. Here are a few pointers to help you out. Philippians 4:13 reminds us that we can do ALL things through Christ. When you face difficulty, turn to Jesus first. So I'm going to go get back on my exercise bike, crank up some Crowder and persevere through this temporary physical difficulty. 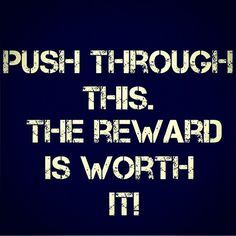 I encourage you to stick with it and push through your difficulty - the reward will be great! *Please note that is it not my intention to compare exercise with the sacrifices being made and the difficulties being faced by Christians all over the world. Rather it is my hope that you can see the correlation between sticking with an exercise program that causes temporary discomfort for physical health and persevering through difficulties for an eternal reward. Sin. We acknowledge we're all sinners. As Christians we are constantly striving (or should be) to beat our sin. But just what sins do we fight? And which ones do we accept or even ignore? I was reading my Bible the other day, and was smacked in the mouth (pun intended!) with another sin. First, I feel I must point out that my mouth is one of my biggest problems. I talk too often, say too much, and more frequently than not, speak when I should be listening. My language could use polished, by both the words I use and the tone in which they come out. My mouth weighs heavily on my mind and in my heart. I constantly feel convicted over it. (Let me pause here and reaffirm that I have grown so much in this area, making leaps and bounds. Yet, I still have so far to go.) (Ephesians 4:29 was written for me- I'm convinced of it- Paul might as well have mentioned me by name.) Therefore, anytime I read something related to our mouths or tongue, I pay attention... 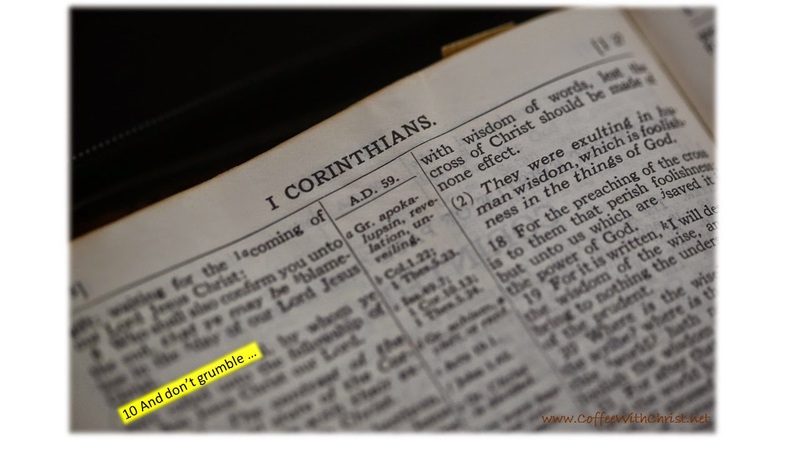 So when I came across 1 Corinthians 10:10, I stopped, kicked it in reverse and reread. "And don't grumble..." Grumbling certainly comes from my mouth. And that in itself sent me in a downward spiral. Ultimately what comes out of our mouths is a vocalized version of what's already harboring in our hearts. (Matthew 18:15, Luke 6:45) So grumbling...(according to my iPad Dictionary means "to complain or protest about something in a bad-tempered but typically muted way") is my complaint that things aren't going the way I want (can we say "spoiled brat"?) My verbalizations of my grumpy heart shows my ingratitude of all that God has given me, and leaves me focusing only on what He hasn't (another pride issue- as if I have a better idea of what's best for me). And as if that weren't enough to stew on, did you notice the beginning of the verse is 'and' (or depending which version you read - 'neither' or 'nor' - basically 'in addition to')...so go back a few verses to see what this is 'in addition to'. (This chapter session is a lesson from the Exodus.) In addition to grumbling, we should not crave evil things, worship idols, overindulge in food and drink (pagan revelry), engage in sexual immorality, or test God. Am I the only one that initially thought grumbling seemed a little out of place here? The rest all seem like legit sins. But grumbling? How does that even fit in here? Hmm. Maybe that's the point of how significant grumbling is; how much it hurts God. Remember the Exodus? God cast judgment on the Egyptians for imprisoning the Israelites, His chosen people. He saved them from that life. He rescued them with multiple miracles (His presence as a cloud, parting the sea, providing food from Heaven, allowing their shoes and clothes to last 40 years, making them a nation with their own land...and how did they repay Him? They complained about everything. They were tired of traveling, tired of the rules, tired of the manna...they grumbled, leading them to other sins). Because the grumbling was, as stated earlier, a vocalized heart problem. They didn't trust God's plan. They didn't want to endure the hardship to enjoy the reward. And they certainly didn't have faith that He would do what He said He would. We were walking through the mall, my six year old and I, while my teen daughter happily traipsed around the mall with her gal pals. In the center court was the giant Easter display, complete with an Easter bunny and a place for children to line up for pictures. "A place for children to get their picture taken with the Easter bunny," I replied as we kept on walking towards the area of the mall that had been set up for children to play and parents to take a break. "Don't they know the Easter bunny isn't real? That Easter is about Jesus?" she questioned. Now don't get me wrong, I don't judge anyone for enjoying the Easter bunny tradition. My older children delighted in discovering their Easter baskets that had been skillfully hidden by the bunny when they were younger. But one Easter my husband and I looked around us as the children devoured their chocolate bunnies and realized that they had totally missed the point of Easter. That we had failed to share the importance of what were were celebrating. And our Easter celebration became less about the bunny and more about Jesus. In a world full of hurting people, it seems especially important to share the truth of Easter. While a bunny may bring temporary relief (it is chocolate after all!) from the things that get us down, eventually the chocolate is gone and reality sets in again. 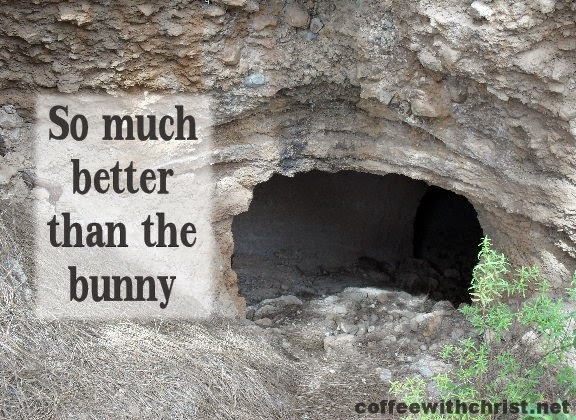 But if we instead focus on Jesus we see that Easter is about so much more than the bunny. It's about one man, who was the Son of God, choosing you and I over His own comfort, even His own life. It's about one man enduring pain, shame and rejection so that one day we won't have to. I don't know about you, but for me that is a much better message to share with my children than the bunny. Today is Good Friday. A day that over 2,000 years ago must have felt anything but good to those who were there. I can only imagine how it felt to watch the man that had become one of my closest friends, the man I believed to be God's own Son, hang on a cross and later be buried in a tomb - dead. But it is that act that brings us so much hope today. Hope that there is more to this life that what we are presently experiencing. Hope that God can overcome everything! Because if death can't hold him (and we know it can't) nothing else can either! This Easter especially that thought brings me comfort. It's a message I want to share with you. No matter what you are going through, no matter how difficult or dark things may appear, this isn't the end of the story. That is what Easter is really about. If you know Jesus, if you have accepted the gift He freely gave on the cross, then you know how the story ends - in victory. So don't focus on the here and now, it is fleeting. Instead, focus on the truth that you are loved so much that He couldn't let anything separate you from Him, not even death. No bunny can even compare to that!